Use a golf tee at the start of each hole. The term "golf tee" has two meanings. The tees on a golf course refer to the areas where the holes begin -- also referred to as the teeing ground. The teeing ground typically includes three to five sets of tee markers. Players must place their balls within a designated area on the teeing ground for their first shot. 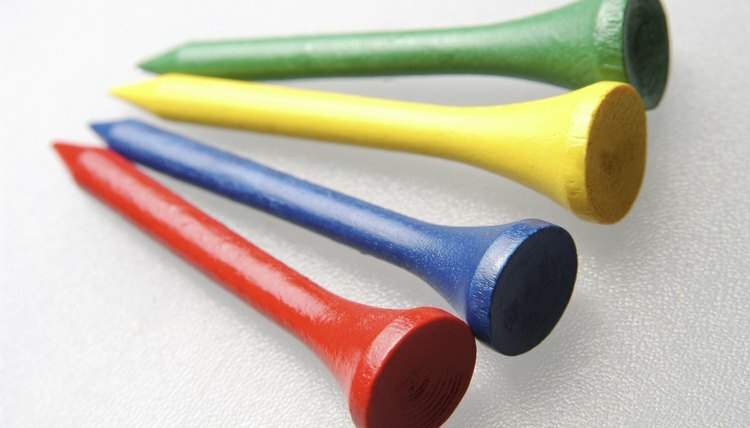 A golf tee is also the small apparatus -- sometimes call a peg -- that's pointed on one end and concave on the other. The player pushes the pointed end into the ground. He then places his ball on the concave end and hits the ball off the tee. Tees can only be used at the beginning of each hole on the teeing ground. Players in the 1800s used a little hill of sand or dirt to tee up their balls. The elevation made the ball easier to see and hit. Sand boxes were provided in the tee areas, as were water and towels to wash the player's hands. Arthur Douglas and William Bloxsom, two Scotsmen, are credited with developing the first portable tee made from rubber. Another Scotsman designed a tee that could be pushed into the ground for added stability. Dr. George Grant, an American, patented a tee that's very similar to the modern tee but with a flat head rather than concave. The Rules of Golf allow tees to be used, but only on the teeing ground. Modern tees are usually made from wood or plastic. Biodegradable tees do exist that if left in the ground will add nutrients to the soil. Biodegradable tees may not seem like an important step; however, tees often fly off and are lost when the ball is hit. If they're plastic they don't decompose. Wood does decompose but the painted wood takes quite time to return to the soil. The plastic may be mixed with strengtheners or colorings and formed into pellets, which are fed into a hopper. The pellets move into an injection mold, where they melt and are forced into the mold's recesses. When the plastic cools, the tees are ejected. The tees are finished by removing any seam material from the molding. Logos, or personalization, may be added to the tees. The tees are then packaged. The bark is removed from the logs, which are cut into slats. The slats are carved into round dowels that are checked for quality, and defective ones are removed. A lath cuts the dowel into a rough tee shape. The final shape is made with a tool called a trumpet. Each tee is cut from the dowel after the tee is formed. The next steps are sanding, painting and drying. Sanding takes place in a drum. The sanded tees are sorted by sending them over a machine that removes the end dowel pieces and any imperfectly shaped tees. Paint is applied to the tees in drums that hold more than 200,000 tees. Every time the drum turns the tees are exposed to paint. The painting process takes two hours, after which the tees are dried for two hours.